S4W-17438 Jackie Baillie: To ask the Scottish Government what impact the so called the Munby judgement (R v Manchester Council, ex parte L and others, and ex parte R and others), has had on its approach on differences between how foster and kinship carers are treated. The Munby Judgement was a precedent ruling which showed that the differential treatment of Kinship and foster children on the same legal status (Looked After Children) was illegal under articles 8 and 14 of the European Convention on Human Rights on discrimination. This ruling has now been tested across England making councils treat children equally1, but has yet to be tested in Scotland, where inequality remains. 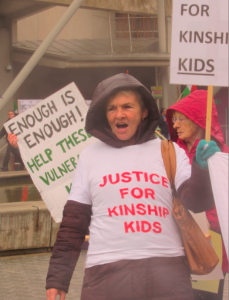 On Tuesday 24thSeptember Chair of the Alliance Anne Swartz also gave evidence to the Education and Culture Committee on the proposed Kinship Care Orderin the Children and Young People (Scotland) Bill, which the Alliance are opposing. The testimony received wide press coverage. S4W-17406 Neil Bibby: To ask the Scottish Government what guidance it has issued on the needs of pupils in kinship care. S4W-17407 Neil Bibby: To ask the Scottish Government how it provides (a) pastoral care and (b) help with behavioural difficulties resulting from early years traumas for pupils in kinship care and what support it provides to help get parent/guardian consent for extracurricular activities. home with their parents and (b) enter a kinship care placement. kinship care is (a) prioritised and (b) supported. (b) in foster care and (c) in residential care homes. making with its review of kinship care allowances and when it will be published. plans to fund future research on this. anxiety and (c) attachment disorder. provides to them on what support should be provided to the carers. provides to kinship carers who provide informal care arrangements. S4W-17419 Jean Urquhart: To ask the Scottish Government for what reason kinship care was not included in its 2010-2015 carers strategy. S4W-17420 Jean Urquhart: To ask the Scottish Government for what reason kinship carers were not invited to join the Carers Parliament in 2012. S4W-17421 Jean Urquhart: To ask the Scottish Government for what reason it has not published the response by the New Fossils, East Glasgow Kinship Care support group to the Children and Young People (Scotland) Bill. S4W-17422 Jean Urquhart: To ask the Scottish Government what information it has on the support of kinship carers for the Children 1st Kinship Care project. S4W-17423 Jean Urquhart: To ask the Scottish Government what meetings it has had with (a) Children 1st and (b) kinship care support groups since April 2011. S4W-17424 Jean Urquhart: To ask the Scottish Government how many meetings it has had with organisations regarding kinship care since April 2011, broken down by group. S4W-17425 Jean Urquhart: To ask the Scottish Government whether the Minister for Children and Young People (a) has met and (b) plans to meet the Scottish Kinship Care Alliance on the issue of kinship care and what the reasons are for its position on the matter. residence and (B) supervision orders and, if so, how it does this and since when. S4W-17427 Jean Urquhart: To ask the Scottish Government what work it has carried out in the last three years to establish and consolidate links with groups, charities and other non-governmental bodies that have specialist knowledge and skills in kinship care arrangements. S4W-17428 Bob Doris: To ask the Scottish Government what discussions it has had with the Department of Work and Pensions on the benefit entitlements for kinship carers proposed by the Children and Young People (Scotland) Bill. S4W-17429 Bob Doris: To ask the Scottish Government whether priority access to specialist psychological and therapeutic services will be available to children subject to kinship care orders under the Children and Young People (Scotland) Bill. S4W-17430 Bob Doris: To ask the Scottish Government how many children have been given formal kinship care status in each of the last three years. S4W-17431 Bob Doris: To ask the Scottish Government whether it has issued guidance to local authorities on reducing the number of children receiving formal kinship care. S4W-17432 Bob Doris: To ask the Scottish Government whether it has commissioned research on whether there are barriers to the full use of the available legislation for the provision of kinship care placements. S4W-17433 Bob Doris: To ask the Scottish Government whether it considers that there are barriers to the full implementation of the kinship care orders proposed by the Children and Young People (Scotland) Bill and, if so, what these are. S4W-17434 Bob Doris: To ask the Scottish Government whether it will provide extra funding to support kinship care placements. S4W-17435 Bob Doris: To ask the Scottish Government what discussions it has had regarding how kinship care would be resourced in an independent Scotland. 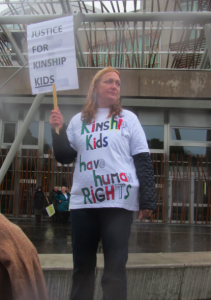 S4W-17436 Alison Johnstone: To ask the Scottish Government what plans it has to review the needs of children in kinship care and their carers and what recent work it has carried out on this. S4W-17437 Alison Johnstone: To ask the Scottish Government what information it has regarding how much it has cost each local authority to provide services for children with (a) formal and (b) informal kinship care arrangements in each of the last three years. S4W-17439 Jackie Baillie: To ask the Scottish Government what information it has on how many carers with (a) formal and (b) informal care arrangements receive financial support packages from their local authority. S4W-17440 Jackie Baillie: To ask the Scottish Government how many children with (a) formal, (b) informal and (c) other kinship care arrangements have been placed on the child protection register in each of the last three years. S4W-17441 Jackie Baillie: To ask the Scottish Government what the average cost has been of keeping a child in (a) residential, (b) foster and (c) kinship care in each of the last three years and what research it has carried out on the cost differentials. S4W-17442 Jackie Baillie: To ask the Scottish Government what its average annual expenditure will be for (a) formal and (b) informal kinship care placements if kinship care orders are introduced and what information it has on what the cost will be for local authorities. S4W-17444 Jackie Baillie: To ask the Scottish Government what its position is on whether children in kinship care have comparable needs to those in foster or residential care. S4W-17445 Jackie Baillie: To ask the Scottish Government for what reason there are differences between the levels of support offered for children in formal kinship care and foster care placements. S4W-17446 Jackie Baillie: To ask the Scottish Government what information it has on how many children in kinship care have siblings in (a) residential and (b) foster care. S4W-17447 Jackie Baillie: To ask the Scottish Government whether children in kinship and foster care have the same access to (a) housing benefit, (b) carers respite, c) psychological services and (d) educational services. S4W-17312 John Finnie: To ask the Scottish Government how many children in kinship care are living in (a) formal arrangements, (b) under section 11 orders of the Children (Scotland) Act 1995 and (c) other informal arrangements, also expressed as a percentage of all children in the country. S4W-17313 John Finnie: To ask the Scottish Government how much it estimates that (a) it and (b) local authorities will spend annually for each (i) formal, and (ii) informal kinship care placement, following the introduction of the proposed kinship care order. S4W-17314 John Finnie: To ask the Scottish Government how many (a) informal and (b) formal kinship care placements it estimates there will be in 2015. S4W-17315 John Finnie: To ask the Scottish Government whether children in formal kinship care have comparable needs to those in informal kinship care. S4W-17316 John Finnie: To ask the Scottish Government what its position is on the finding in the report, Spotlight on Kinship Care, that (a) in 2001, one in every 71 children in Scotland was being brought up by grandparents or other relatives and (b) informal kinship carers save the taxpayer between £23,500 and £56,000 a year, despite many of these carers finding themselves in poverty. S4W-17317 John Finnie: To ask the Scottish Government whether psychological and therapeutic services are available as a priority to children in kinship care subject to (a) a residence order under section 11 of the Children Scotland Act 1995 and (b) looked-after child status.